George Clooney has talked about putting on his dancing shoes in Money Monster. 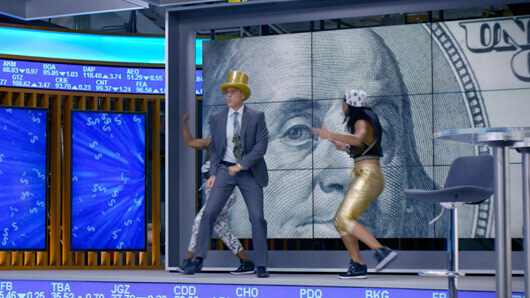 In a feature for the film, which premieres for the first time on free-to-air television tonight on Sony Movie Channel at 9pm, Clooney and his co-stars talk about Clooney’s infamous dance moves in Money Monster. Money Monster tells the story of a flamboyant financial advice show host, Lee Gates (Clooney), whose faulty on-air advice prompts an irate investor to take Gates and his crew hostage on live television. Director Jodie Foster confirms the dance opening to Money Monster was entirely Clooney’s idea. “There wasn’t really that much choreography,” says Clooney. “I just said ‘let’s go’. The girls were these great dancers and I said I was going to do some dumb dances and you follow. Tune in to Sony Movie Channel on Friday 8th February at 9pm to witness the Free-To-Air premiere of Sony Pictures taut thriller, Money Monster.